I got up to a beautiful sunny day. Hotel reception had no idea whether I’d paid or not, but seemed happy to take it on trust that I had. It seemed about par for the course as far as this hotel is concerned. 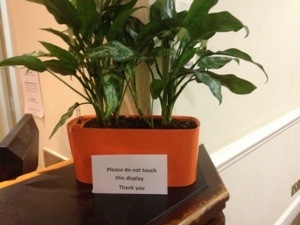 Weirdly protective over potted plants too. 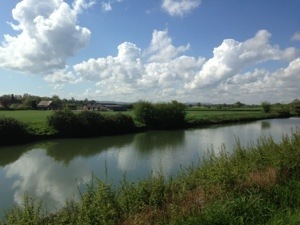 I set off following the NCN route along the Gloucester to Sharpness canal. It was good at first, but after about 5 miles the surface began to deteriorate. 10 minutes later I was on little more than a bumpy dirt track. An all too familiar spoke scenario was looming, I could feel it in my bones. I resolved to get off the canal as soon as possible, but I was in the middle of nowhere. Lovely, but definitely the middle of nowhere. When I eventually found Tarmac I gave the back wheel some close scrutiny. I was 28 miles from Bristol, so switched to the A38 for the fastest and smoothest route in. I had a good bike shop recommendation so it was time to focus. I was a day and a half ahead of schedule, and I figured I could leave it with them for a couple of days. Odd how 80 miles could pass so easily yesterday, yet less than 40 be so difficult by comparison today. It must have been the hills. I arrived in Bristol and headed straight for the excellent Mud Dock where they confirmed there was nothing fundamentally broken, and tensioned my spokes up while I had a fantastic burger for lunch. It was the earliest finish after the shortest day cycling so far. I was still knackered though.